Classic There are 24 products. 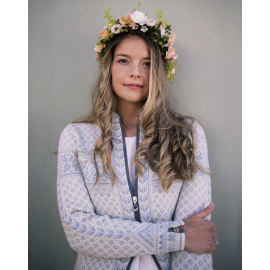 The Viking Women’s Jacket embraces contemporary, modern style while paying tribute to Norway’s Viking heritage. Viking runes symbolizing “protection” and “victory” adorn the back of the sweater, while advanced knitting techniques create the appearance of protective armor across the shoulders, and arrows along the zipper. 100% Merino lamb’s wool. The great Bergen jacket celebrates the proud history and landscape of the city of Bergen, located close to the village of Dale. Exclusive elements are incorporated into the design, such as the seven mountains surrounding the city, the medieval stone hall Haakonshallen, the fish, and an old Norse symbol, Valknut, used as protection from the evil. 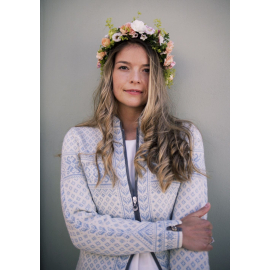 This beautiful cardigan of pure wool is made with a traditional design for a modern lifestyle, cut with a roomier fit to make it suitable for all women. The cardigan has exclusive details as Norwegian pewter buttons on the cuffs and piping along the edges for a refined look. 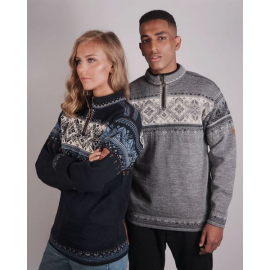 This incredibly soft and lightweight sweater is a new addition to the Viking concept, designed as the official sweater for the Norwegian National Alpine Ski Team during the 2017-2018 season. It is made of exclusive wool from Merino lambs, creating a textured appearance. The bold pattern includes the runic symbols for victory and protection. A contemporary, soft and lightweight sweater made with the new and exclusive wool from Merino lambs. The yarn creates an elegant textured look, and offers a comfortable and cozy feeling. A feminine and elegant sweater with beautiful snowflake patterns and neck details. It is made of 100% skinsoft and lightweight Merino wool in a superior, long-lasting knitting quality, with flattering side slits at the hips. 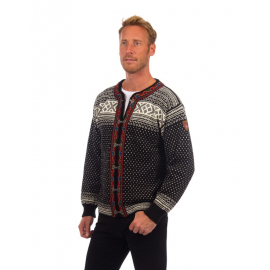 This sweater was designed in celebration of Dale of Norway’s 125th anniversary. The design combines many of the most famous Norwegian knit patterns, the eight-petal rose, the Setesdal valley cross and the “lusekofta,” or lice pattern, recognized as small v-shaped dots in the pattern. This timeless bestseller was made for the Alpine World Championships in Vail, Colorado, and quickly became a bestseller. This design is inspired by traditional Norwegian patterns with variations of the eight-petal rose and beautiful Norwegian elk-leather detailing. A handsome men's sweater with a classic look that will remain timeless for years to come. Looks great at the office - and the après ski party! A beautiful feminine outdoor design made with a lightweight rib knit and authentic detailing. It is a great lifestyle sweater and the premium knit quality ensures that it will last for years and keep its crisp look. Furu is a pine tree that is widespread in the Norwegian forests and mountain hunting areas.